MILAN--(BUSINESS WIRE)--Blasting News - the largest global social news magazine founded in 2013 by the Italian entrepreneur Andrea Manfredi - has been awarded funds by the Google Digital News Initiative (DNI) to develop an innovative project designed for the European publishing industry. Today, after little more than a year, Blasting News is preparing for the official launch of Blasting360, the first European marketplace for curated content, designed to connect journalists and publishers all over Europe. Andrea Manfredi, founder and CEO of Blasting News, will announce the official launch of Blasting360 during a press conference that will take place in Milan on Tuesday the 6th of June, at 12.45pm, in the roof terrace of the prestigious Hotel The Viu Milan, in the restaurant of the Michelin-starred chef Giancarlo Morelli. Tom Corbett, Head of European Division International News Media Association, will also participate at the event as a guest speaker. “I would like to thank again Google Digital News Initiative, which offered funds to help make this project possible. 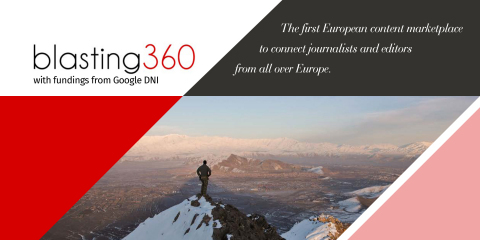 Blasting 360’s goal is to offer a completely new perspective to the European digital journalism industry. Leveraging on the network we have built over the past few years and the technology we have developed at Blasting News, we want to offer to all the European publishers the power of crowd-sourcing” says Manfredi. Blasting360 will enable all European publishers to receive or request tailored, multi-format media contents produced by a qualified network of journalists, content creators and opinion leaders. Publishers will finally have a platform that allows them to easily access multi-format media, both mainstream or geographically targeted, in real time and at an absolutely competitive price. Publishers will be free to choose the content that best meets their needs, either by selecting them through a proprietary algorithm which identifies the trending news and creating tailored news feeds or by requesting customized content to specific journalists according to the specific needs.